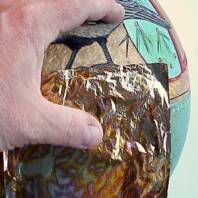 *This article was originally published in the February 2003 issue of "Gourd Art Today"
Gold or other types of metallic leaf can provide a wonderful enhancement to your gourd projects. The luster and shine of leafing is much more intense than ordinary paints, and is an eye-catching accent. Imitation leaf is readily available from art supply houses, craft or hobby stores, and many online sources. It is the most economical choice for the gourd artist as real gold leaf is very expensive. It is also possible to purchase complete kits that contain all the necessary supplies at a reasonable cost. Most types of leaf come in "books" of 25 leaves, and each sheet (separated by tissue paper) is usually 5 ½ X 5 ½" square. Although it may seem a bit expensive for what appears to be a small package, a book of 25 leaves will cover a lot of area and last a long time! Imitation Gold Leaf: Imitation Gold Leaf may also be referred to as "composition leaf", "brass leaf", or "Dutch metal". It is made from copper and zinc, and produces an appearance similar to that of genuine gold leaf. Imitation Gold is available in different shades of gold and is an excellent leaf for patinas. It will tarnish and is not recommended for exterior applications. Aluminum Leaf: Also called "imitation silver leaf". Aluminum leaf is an excellent substitute for silver. Aluminum leaf does not tarnish, but it does oxidize. 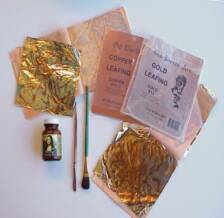 Copper Leaf: Copper metal leaf for indoor use. Variegated Leaf: This is a highly decorative leaf with random markings of different shades of color. Each sheet is burned by hand to produce a pattern of oxidized colors. No two sheets are alike. It is available on red, blue, black or green background. Magic Leaf: Similar to variegated leaf, but has distinct patterns such as stars, stripes, circles and squares. Comes in a variety of colors and designs, but is hard to find. Flakes: Flakes are small pieces of random sizes that come packaged by gram weight. Comes in gold, copper and silver, also in mixed shades of colors. Traditionally, the adhesive "size" used to adhere leaf was made from varnish. I prefer to use water based adhesive size (glue) so that cleaning up is easy. Old World Art and Mona Lisa are easy to find brands, but there are several other brands that will work fine. Although the instructions on the bottle say the adhesive will wash out with soap and water, it can leave a residue in the bristles that is hard to get out. It helps if you rub just a bit of liquid dish soap into the bristles of the brush to make clean up easier, or keep a brush that is only used for leafing. Shake the bottle well before using. Variations in temperature and humidity will affect the drying time. Because genuine gold leaf is extremely thin, a red oxide undercoat was traditionally applied to enhance the color of the leaf. I have not found this to be necessary when using imitation leaf, unless you are trying to reproduce an antique crazed type finish. I apply the leaf directly to the gourd surface. The leaf should be sealed, as it will oxidize over time. Clear shellac is a traditional finish. Water based varnishes are suitable, and will clean up easily. Some satin spray finishes will leave a dull film on the leaf, be sure to experiment first before using a new finish on your art! You may want to use a soft flat brush to help move the leaf to your working surface. A slightly stiffer flat brush should be used to smooth down the leaf and brush off the excess. I keep the excess in between the tissue pages of the book or in a little tub, for patching up spots that were missed. An old sock or soft cloth makes a nice buffing tool to make the leaf shine. 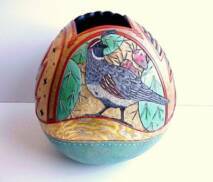 1) Decorate your gourd with paints, dyes or whatever finish you choose. It is much easier to apply the leaf last instead of trying to work around it. I often pyroengrave a line around the area to be covered, which helps give a clean edge to the leaf. You can seal the gourd before leafing if desired, but the leaf should also be sealed when finished. 2) Paint on the adhesive size where you want the leafing. The leaf will stick anywhere you put the glue, so be sure to work neatly. The water based adhesive size will take about an hour to dry, and will turn from a milky white to clear. To avoid a gummy mess, do not apply leaf until the size is dry! 3) Remove a sheet of leaf from your package. The leaf is very light and flies away very easily, so be sure to work in a draft-free area. One way of applying gold leaf is to use wax paper. Cut wax paper a bit larger than the leaf, and lay it over a piece of gold leaf. Press your hand firmly over the wax paper; the pressure and heat from your hand will cause the gold leaf to stick to the wax paper. You can also carry the leaf in between two sheets of tissue, sliding the tissue out from under the leaf before applying. If you use your fingers to lift and apply the leaf, be sure they are clean, as excess oils can discolor the leafing. 4) Press the leaf onto your surface with fingers or a soft brush, patching up spots where the leaf didn't cover as you go. For patching you can use little pieces of brushed away leaf (called skewings). If there is a large section of excess leaf that is loose, you can gently rip it off and use it in another area. 5) Use the slightly stiffer brush to brush away all the excess leaf. You may need to scrub at some places if there are tight corners. Just keep lightly scrubbing away at it until all the excess has come off and all you are left with is your design. If you find you've missed a spot with the size, or the leaf didn't stick very well to an area, just touch it up with more glue and re-leaf it when it is dry. If the design's edges are a bit uneven, you can a razor blade or art knife to scrape the leaf away on the edges to clean the image up. Lightly polish the leaf by gently rubbing in a circular pattern with a soft cloth. 6) Apply a clear sealer to keep your leafing from tarnishing. If you enjoyed this basic project, you may want to try experimenting with reactive agents such as vinegar, salt, lemon juice, and patinas to vary the final finish of the leafing. Antiquing agents are also available if you prefer to tone down the metallic look of the leaf.